This development of 13 flats in Hamilton Street has been built on the site of an outmoded 1970s Kirkbrae residential home. It is pleasing that some of its former residents are returning to brand new self-contained homes supported by care tailored to their specific needs. 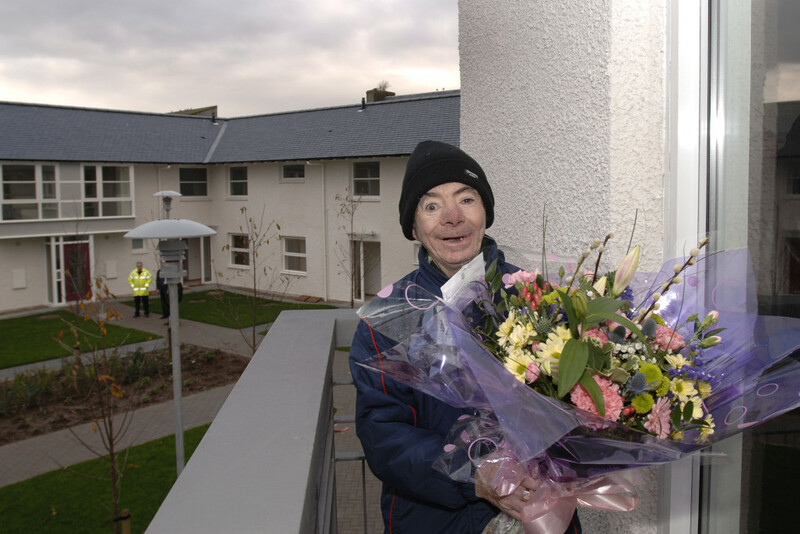 These include Tommy Henry (pictured) who joined local Councillor Ian Fitzsimmons in declaring the development open on 2 December 2005. The development has helped to remake the streetscape which was lost in the 1970s in Girvan’s historic core. The total cost was £1.3 millions and this was supported by a grant from Communities Scotland of £1million. It formed part of a joint project with South Ayrshire Council and Quarriers to replace two out-moded residential homes in Girvan – Kirkbrae and Seabank linked to improved access to local care provision.